Casa Solana in the northwest part of Santa Fe about a mile from the center of town, where Monica and Bram live, was the site of a World War II Japanese Internment Camp in which as many as 2,100 Japanese men at a time (4,555 in total) were imprisoned, between 1942 and 1946. Similar New Mexico detention centers were also set up in Fort Stanton, Old Raton Ranch and Camp Lordsburg in New Mexico. From the mid 1930s to 1942 the property had been the location of a camp for the Civilian Conservation Corps (CCC). Interestingly Allen Stamm – the house builder of Monica's and Bram's home and most of the Casa Solana area – was part of a posse assembled the day after the Pearl Harbor attack to keep watch over the local power company, the railroad bridge near Lamy, and a Japanese gardener in Tesuque (two nearby towns). Stamm later bought the property for $98,000 in 1953 when it was auctioned off by the New Mexican Prison Board. Last Saturday we attended a performance presented by the "Confinement in the Land of Enchantment Project," which "documents the histories of Japanese American internment in the state and seeks to inspire thought and conversations about issues of citizenship, identity, and civil liberty." The play was held at our local branch of the Santa Fe Library in conjunction with a month-long exhibit on the subject. About sixty people were in the audience. There were eight performers including the playwright. The play began with the actors taking turns telling the history of the Japanese immigration to America while photos were projected onto a large screen behind them. 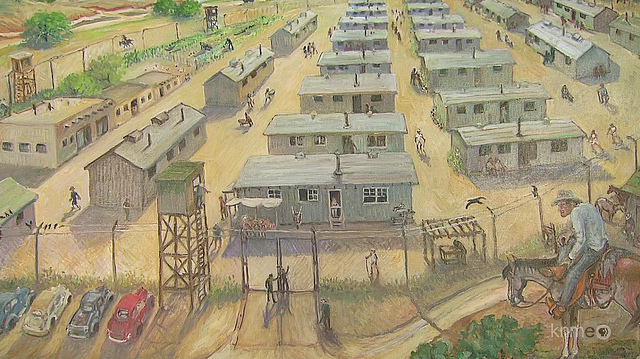 When the narrative came to December 7, 1941 the script changed to a series of personal narratives – some from letters, some from interviews – that told the story of the detainees, their families, and how the surrounding community of Santa Fe interacted with the camp. One actor told her personal story of how her Japanese parents who lived near Pearl Harbor witnessed the event, and how the Governor came to their house the next day, dumped the contents of their drawers onto the floor and left without saying a word. The author related that the day the FBI took her father away was the last time that her entire family was together. After the play there was a discussion with the audience – which included one of the interviewees for the play, an Hispanic native of Santa Fe, who shared of some of her memories of the "Jap Camp" that she passed by on a daily basis. And of an instance when incoming prisoners tossed candy to the children who were watching their arrival. The woman mentioned that today she has a good friend who lives in Casa Solana and how fertile the soil is on her property because of all the gardening work that the detainees did over those four years. Then became emotional as she described "flowers popping up everywhere" today, and the memories they bring back to her. Another woman, who grew up in Portland Oregon, mentioned how she discovered that her family doctor back in the Beaver State had been imprisoned at Santa Fe. And a young man told with pride and sadness how his Japanese grandfather served in the U.S. Army's 442nd Infantry Regiment during WWII, at the same time that the speaker's great grandfather (the soldier's father) was in the Santa Fe camp – a not uncommon situation. It was a well done, moving, and sometimes wrenching history lesson.